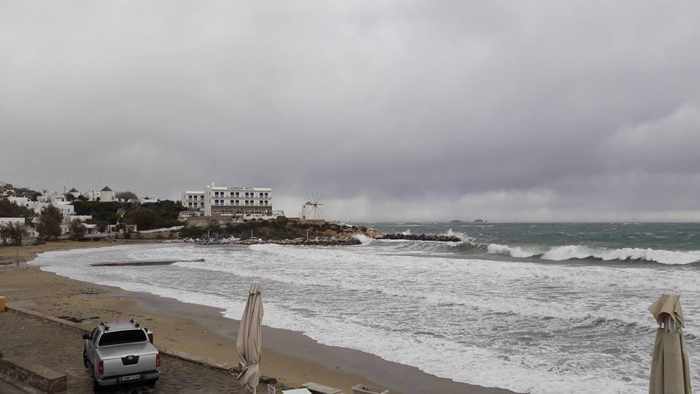 The sun is brilliant as strong winds and waves pummel a beach in the Glyfada area of Athens. This image by Jacqueline St. John-Jones shows a view toward some of the Saronic Gulf islands and mountains in the eastern Peloponnese. 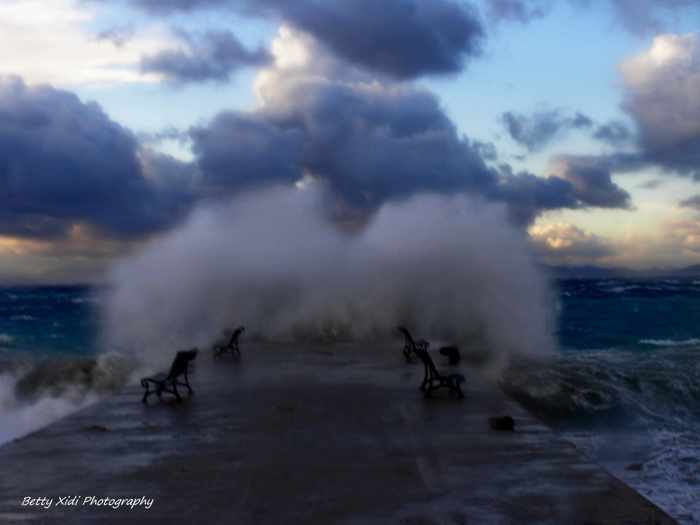 Photographer Betty Xidi captured this shot of a wave breaking against the pier at Psaropoula beach at Rhodes Town. She posted additional photos and several videos on her Facebook page Rhodes Through My Eyes. A view of the moody sky above Paroikia on Paros. 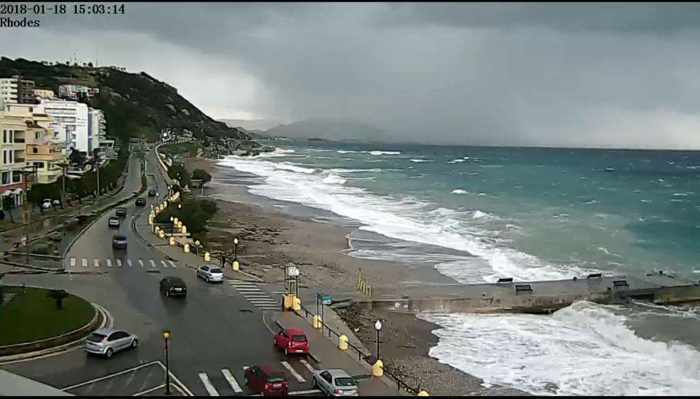 This and more storm photos, plus a video, were posted to the Meltemi Café Paros page on Facebook. 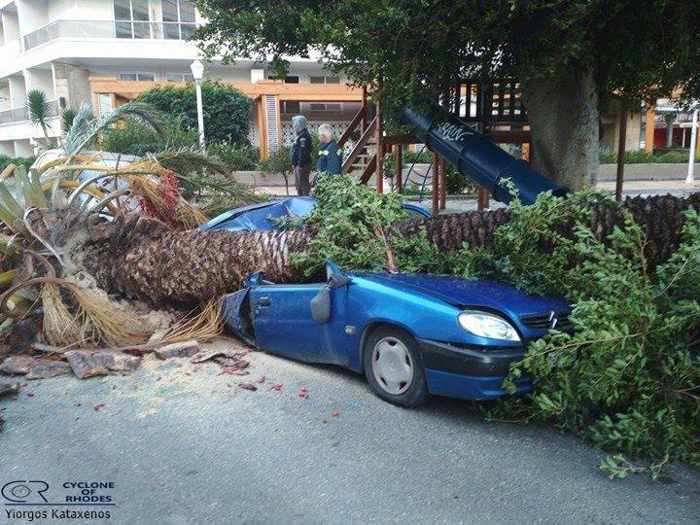 The severe winds toppled a number of trees in Rhodes Town, one of which crushed a parked car. This and other photos by Yiorgos Kataxenos, plus a few videos, were posted on the Rhodes Rodos Ροδος page on Facebook. 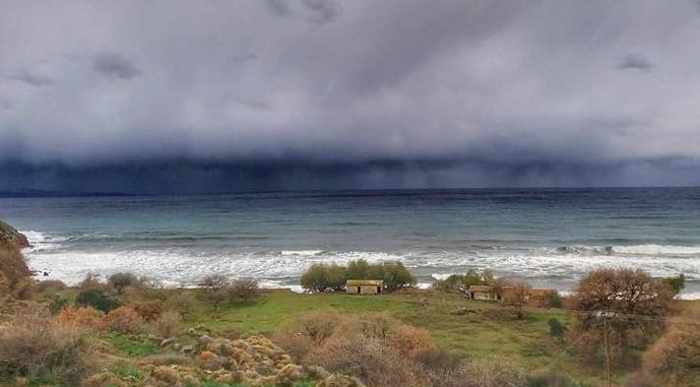 Dark clouds threaten while large waves roll ashore at Galissas beach on Syros. 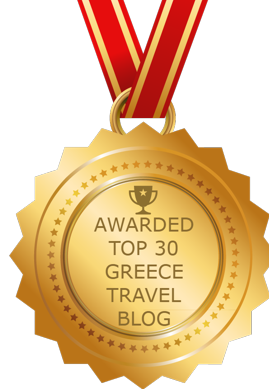 This and several more photos, plus two videos, were shared on the Γαλησσάς – Galissas page on Facebook. 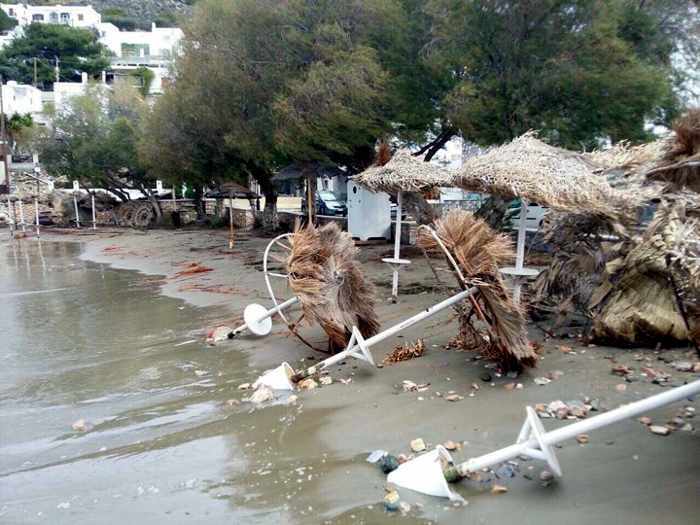 Winds that nearly reached hurricane strength slammed Syros island, downing trees and damaging some waterfront areas including this section of Kini beach. 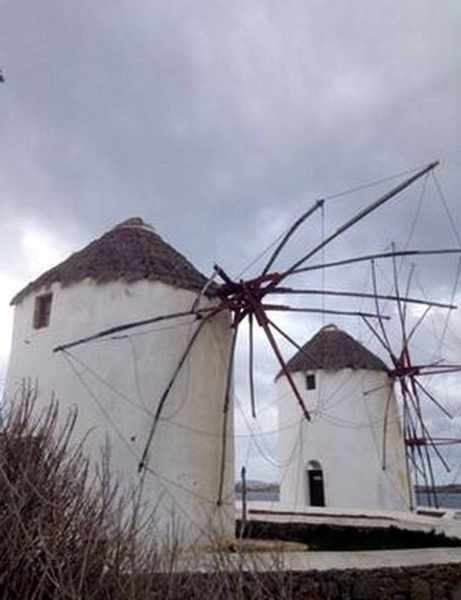 The photo appeared in a January 18 storm report on the news website Cyclades.gr. 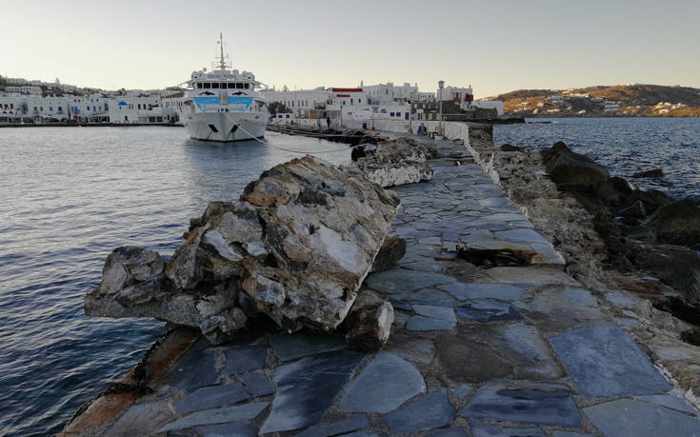 While winds thrashed the Little Venice seafront of Mykonos, strong waves washed rocks and stones off the shore and scattered them across walkways and patios, as seen in this Facebook photo by Xrysoula Gripari. 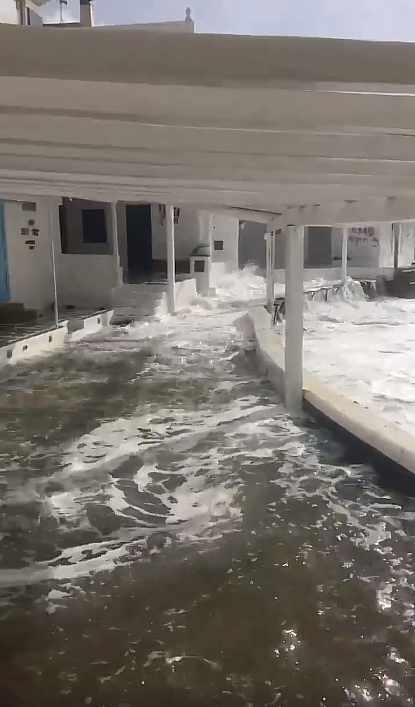 The entire strip of Little Venice cocktail bar verandas is completely submerged as waves breach the seawall at Mykonos Town. This scene is from a short video shared on Facebook by Kostanthnos Markaris. 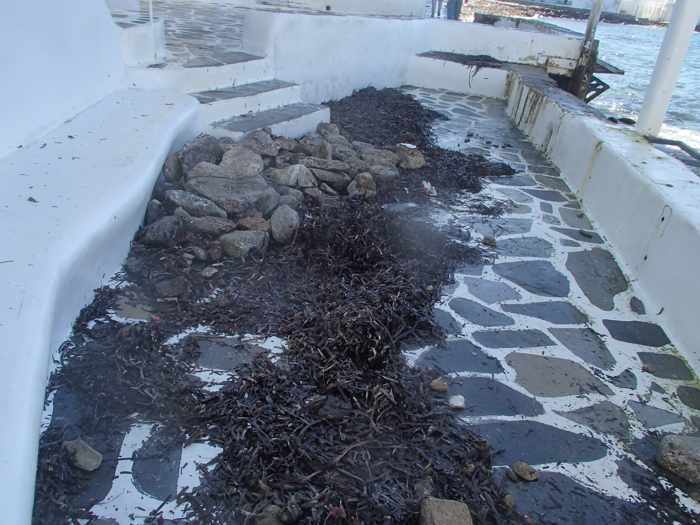 A photo by Xrysoula Gripari showing debris left on one of the Little Venice bar terraces after the winds subsided and the seawater receded. Punishing waves took their toll on sections of the Mykonos Old Port mole used by the Delos excursion boats. 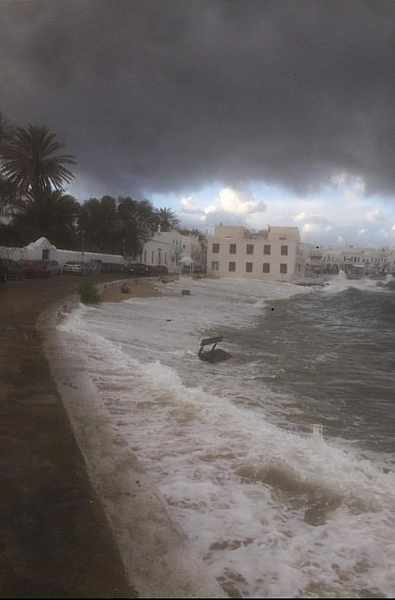 This image is one of several that the Cyclades24 website published in a January 20 news report about the damaged jetty. 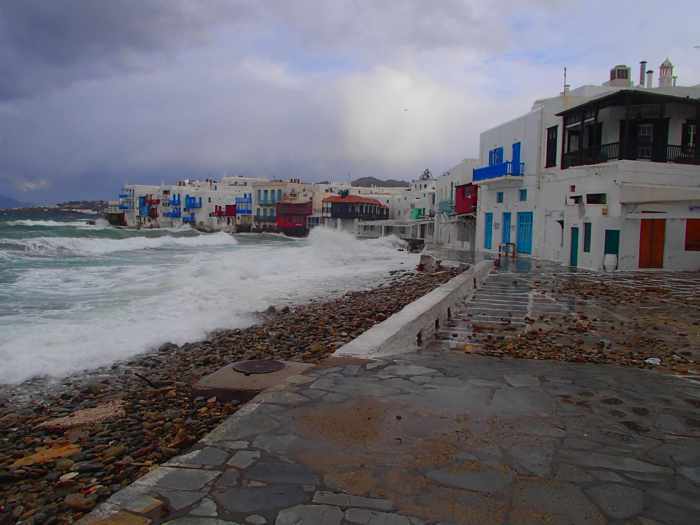 Dark clouds menace as waves swamp Agia Anna, the small beach near the Old Port at Mykonos Town. The photo was posted on Facebook by Kostanthnos Markaris.